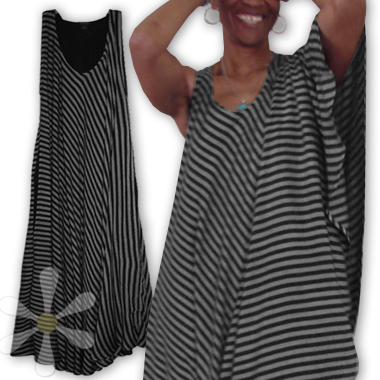 This gorgeous two-layered dress is in our RARE woven stripes over black sousde. And it's PLUS SIZE! It is in true ethnic style, evoking traditional North African, Middle East, and Mediterranean garments—and the details are fantastic: this one is sleeveless, has 8" deep side pockets, MILES of flowy fabric... and the whole thing drapes and flutters like a desert dream on so many shapes and sizes! And the handmade quality of this natural susti fiber is simply superior, rich, and luxurious. You can save it to wear for special events—it's perfectly elegant with the right accessories—but it's so scrumptious, you'll find ways to dress it down to wear more often! The unique design is equally perfect for evening or play, and will make you feel like you're in a Moroccan bazaar, Middle-Earth, or in some wild gypsy dream! For more information -- measurements etc. -- se our main SAFI-PLUS MAGIC DRESS page.